Posted by Ada Wang on 1/4/2019 3:38:28 PM. Barnes and Noble introduced Nook Study to compete with Adobe's Digital Editions. It can access your purchased and placed books in your Nook library. And it also can read Adobe DRM eBooks. But you cannot put all Nook eBooks on other readers such as Kobo eReader because a part of Nook books are protected with Nook DRM while ADE doesn't support the B&N DRM scheme. Kobo Inc totally adopts Adobe Adept DRM, in other words, you can read Kobo books on Nook. However, If you load Nook eBooks (EPUB or PDF) to Kobo eReader, it needs to remove Nook DRM at first in order to open them or convert them to read on Kobo. This guide will show you how to remove DRM directly from B&N EPUB files and read Nook eBooks on Kobo. Epubor all-in-one eBooks DRM Removal removes DRM from all the protected books. Before removing DRM, make sure you can read the Nook books on PC or Mac. There are two tools should be needed: Epubor Ultimate and Barnes & Noble Desktop Reader. Updated 1/4/2019: If you can not download Nook books via Nook for PC, please try to use Nook app for Windows to download the Nook Books. You can get the Nook app from Microsoft Windows store. Epubor Ultimate now support Nook books downloaded via Nook app for Windows. This article will take Nook for PC as example and describe how to use these two tools to make Kobo eReader read Nook books. As long as you can open the Nook books on PC/Mac, this chapter will be suitable to decrypt DRM protection on Nook for PC / Windows 8 / Mac and so on. Just need only one click to decrypt DRM from Nook Epub eBooks with ease. Install Epubor Ultimate and Nook for PC. When you run the Nook for PC the first time, it will prompt you to register or authorize the app with B&N account info. So it can sync eBooks (magazines, etc) from B&N website. After all of them display on "my library" category, right click the cover of each title to download nook books to the local computer. Please make sure you can read all these books on the Nook for PC/Mac. For Nook for Win, navigate to locate your downloaded eBooks: C:\...\Documents\My Barnes & Noble eBooks\Your email address (your account ID). For Nook for Mac, navigate to locate your downloaded eBooks: Finder -> Documents -> My Barnes & Noble eBooks -> Your email address (your account ID). If you still can't find the path of your downloaded books, try to use computer explorer to search the book title. And when the book display in the search result, right click the book title to copy the Nook content path. Then input the path in the computer explorer box and it will show all downloaded eBooks. Now run the all DRM Removal, drag all Nook EPUB files to the program display window. Note: The following way to remove Nook DRM has been invalid, you can click here to learn the latest and easiest method. Click "Setting" icon in the function menu and switch to "Nook" option. Click "Browse" button to locate the source files. Then input your name of the B&N account and full digital number of credit card number without any space between numbers. 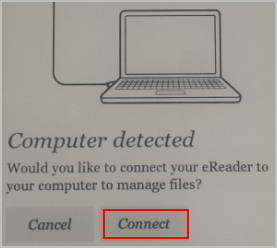 To obtain the correct Barnes & Noble info, navigate to click "setting" in the menu of NooK for PC/Mac or login B&N website. The Nook DRM scheme is based on them and Epubor DRM Removal just creats a private key to decrypt DRM from Nook books for next times. When the decrypted process finished, it will discard all your personal information. Make sure all the info are right, then click ok. Finally tap "Remove DRM" button and it will creat a new EPUB files without any DRM protection. Barnes & Noble officially changes the DRM method since March 2015. The billing name and credit card number method is no longer working on the new DRM. Our product supports its latest DRM scheme at the same time. Now, let's learn how to remove Nook DRM with All DRM Removal. As I mentioned above, after you load Nook EPUB books to the program, once you drag your books to the main window of the software, following window will pop up. 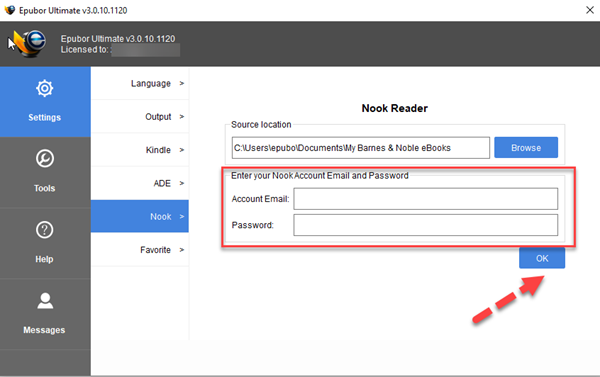 Just input your Nook account and password, click "OK" button, then Nook DRM will be removed automatically. Now right click a title of the book, then tap "Explore decrypted folder" to locate the DRM-free NOOK EPUB books. Plug the Kobo into your computer with USB cable. 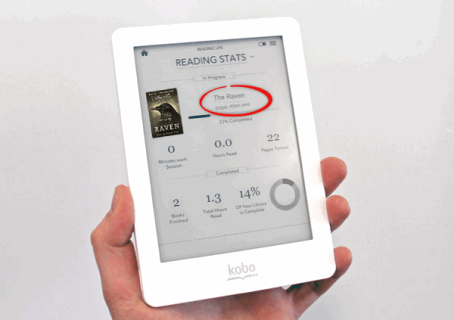 In the Kobo reader, it will prompt "Reading" or "Manger Library" and select the latter. It will pop up a window to prompt open folder, drag the nook books to Kobo eReader. 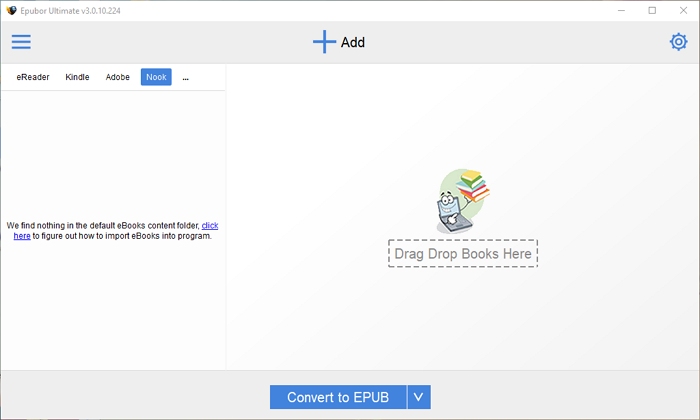 Calibre can also help you transfer epub to eReader device or convert DRM-free books to your custom eBooks format. Wait for the Kobo to process the new content, then start reading journey. How to read kindle books on the Kobo Vox? 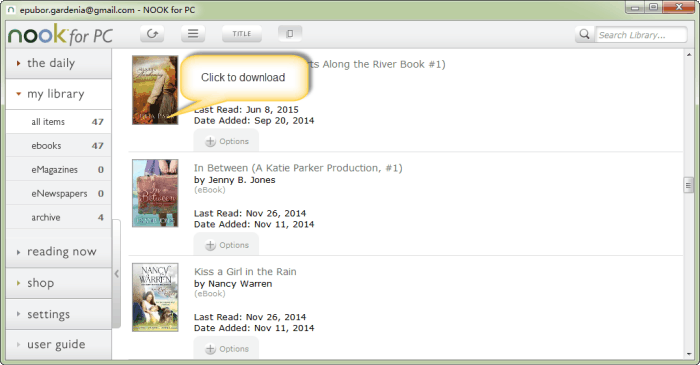 How to use Adobe Digital Editions to read Kobo Books?